It’s Thursday, so Fortnite’s week 6 challenges are now live. That means another seven ways to earn those shiny new battle stars, although a couple of them could be pretty tricky. This week you need to embrace your inner tearaway as you spray over Carbide and Blockbuster posters. Then you need to search between a Playground, Campsite, and a Footprint. 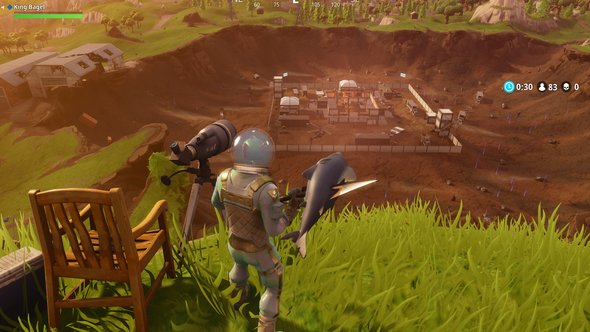 It’s the standard split between four normal challenges and three hard ones for Fortnite’s week 6 challenges, with the normal tasks awarding five stars and the ones marked hard providing ten each. Also, you only need to complete four challenges to unlock the prize of five thousand XP. Here’s a handy list of the best battle royale games on PC. Even if you’ve missed some, you’ll still be able to work on challenges from the previous weeks of Season 4, so check out the Fortnite week 1 challenges, Fortnite week 2 challenges, Fortnite week 3 challenges, Fortnite week 4 challenges, and Fortnite week 5 challenges if you’re missing any battle stars. Battle Pass holders can also complete the Carbide and Blockbuster challenges. This could be a tough one to pull off, especially with everyone else trying to do it, too. Supply drops tend to be in busy areas, and they’re tempting opportunities for snipers. Just watch your back, and search three of them. Find yourself a street sweeper and go to town! All you need is a shotgun and some nearby enemies to complete this challenge. There are lots of locations to scour through around Loot Lake, so head that way and look around. Just be careful, since there are a lot of open areas where it’s easy to get spotted. Find three chests, and you’re done. 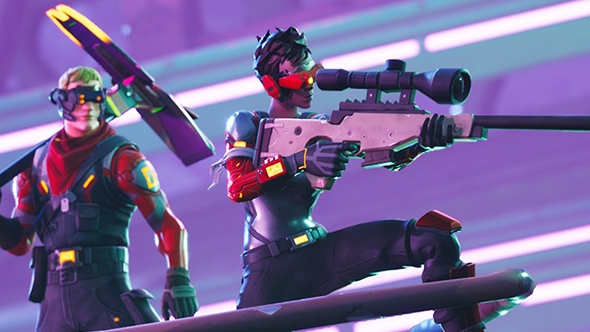 This will take some hunting to get done, but just keep an eye out for posters of Carbide and Omega, two of skins that come with the Fortnite Battle Pass. When you find one, head over and hit B to spray over it. You’ll need to find and tag seven to complete this challenge. 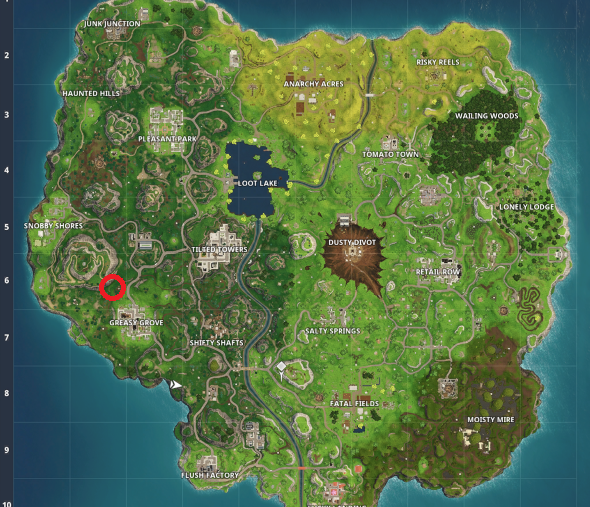 The Footprint is the giveaway for this treasure hunt – it’s that massive dinosaur footprint between Greasy Grove and Snobby Shore. Head that way and you’ll find a bare patch in a grassy bowl nearby, right in the area marked on the map above. Just like it says: finish off opponents using SMGs, and you’ll snag this challenge’s ten shiny battle stars. This week you’ll be able to work on two ten-star challenges at once if you hang out in Retail Row with an SMG at the ready. As always, try to get here early in the challenge when you can count on other players with the same idea in mind. It’s going to be rough in Retail Row once the week 6 challenges unlock, so it’s probably a good idea to get any outstanding challenges there finished before Thursday.